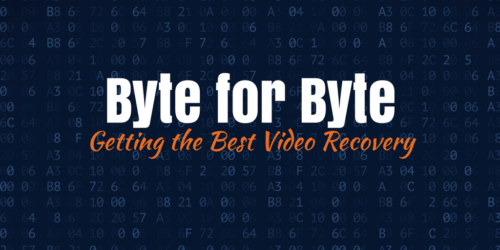 Byte for Byte – Getting the Best Video Recovery - DME Forensics Inc. In the field of forensic video recovery, often “less is more”. It is important not only to find and recover the footage, but to do so with minimal changes to the content. The goal when recovering data is to keep all evidence “forensically sound” – maintaining the integrity of the data so that it can be used as evidence in a court of law. First and foremost, we encourage the use of a write blocker to preserve the original evidence before you begin to read the data. If you already have a write protection device, great! Otherwise, DME Forensics sells a variety of write blockers to prevent overwriting or editing the data in any way during recovery – click here to learn more. Beyond write blocking, how do we ensure the video we recover with DVR Examiner is the same as the video on the disk? One approach is to use lossless transcoding. This process ensures every pixel is the same, with no video quality lost. DME Forensics takes this process one step further with DVR Examiner. Our program recovers the video without transcoding at all. For a given video clip, every byte that represents a pixel is located and extracted, without modification. These bytes are then re-packaged into an AVI container so that they can be easily read and replayed, but the bytes inside that container are never changed from their original recorded values. If it isn’t possible to play back the video within an AVI file without transcoding, DVR Examiner will instead re-package them back into the proprietary format and provide the player. So, when you use DVR Examiner to recover video evidence, you can be confident that the data recovered is forensically sound. After all, our process isn’t just pixel for pixel – it’s byte for byte.